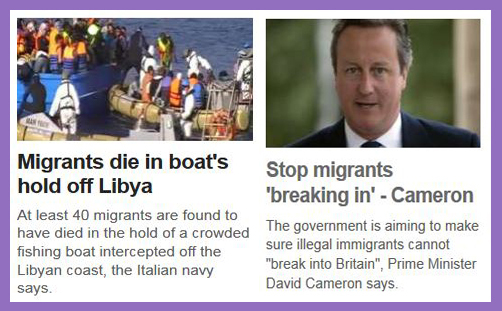 It was an unfortunate, though, quite possibly, purposeful juxtaposition on the BBC News website. On the left, we read that dozens (actually thousands) of migrants are drowning in the Mediterranean as they flee violence, conflict and persecution in their home countries, hoping to walk to Calais and thence cross into the land flowing with milk and benefits. On the right, we read that David Cameron intends to ensure that the “swarm” of illegal immigrants cannot “break into Britain”, because the UK is already “taking its fair share of asylum seekers”, and the honey pot is empty. Ergo the callous Prime Minister is leaving the terrorised and traumatised to perish in a watery grave, basically because we’ve fulfilled our national quota of welcoming huddled masses of humanity, who must now seek security and cornflakes in another land. Sometimes compassion must trump politics. Yes, of course, the very expression of compassion may be an acutely political act, especially on the run-up to a general election. But the political mind that thinks in terms of cost or quotas while children are bobbing up and down in the Med is not a mind that’s inclined toward mercy. “A lot of us, myself included, did not know how to swim. I’d never seen the sea before. Seven or eight of us clung to a lifebelt, but as time went by a lot of them didn’t make it and only two of us – I and another lad, a compatriot who was wearing a life jacket – were left. Then he disappeared too. Others were clinging to little bits of wood and the current carried them away. For many hours – I don’t know how many – we remained in the water in those conditions..
We have a choice: we can either recline on the sunny deck of our luxury yacht, nibbling at syrupy strawberries and sipping Bollinger while Hamed goes under for the third time, or we can extend an arm, bring him aboard, wrap him in blanket, fill his belly and wipe away his tears. Or perhaps there’s another option: leave it to someone else – Italy or Greece or someone – because Britain is already “taking its fair share of asylum seekers”. What nature conspires to cynicism and impartiality when faced with a drowning child? What moral outlook reasons that these impostors can flee for refuge if they want, but not at my expense? Do we not inhabit and are we not heirs to the infinite riches and wealth of the kingdom of Christ, or are we just citizens of a vast, amoral, impersonal, monolithic social structure, whose capacity to absorb has been reached, and whose quota of compassion is fulfilled? It is an inner weakness to plead incapacity in the face of human responsibility. We save and liberate because we love, not because we can afford to. It is a false value and a repellent moral code which ramps up the rhetoric in preference to binding up wounds and healing the brokenhearted. ‘Thou shalt neither vex a stranger, nor oppress him: for ye were strangers in the land of Egypt‘ (Ex 22:21). ‘Pure religion and undefiled before God and the Father is this, To visit the fatherless and widows in their affliction..‘ (Js 1:27). ‘A father of the fatherless, and a judge of the widows, is God in his holy habitation’ (Ps 68:5). Pray God that you who turn a blind eye are never forced to sit by the rivers of Babylon, weeping for Zion, singing the Lord‘s song in a strange land. Forgotten, abandoned and tormented, there is no hospitality or compassion: the quota has been fulfilled.